1. It provides pre-loading against the tips of two precise driving screws for elimination of backlash. 2. It ensures the absence of the roll coordinate. The Highly Stable Precision L-shaped Optical Mounts have two M10x1 threaded mounting holes for mounting of the actuators. 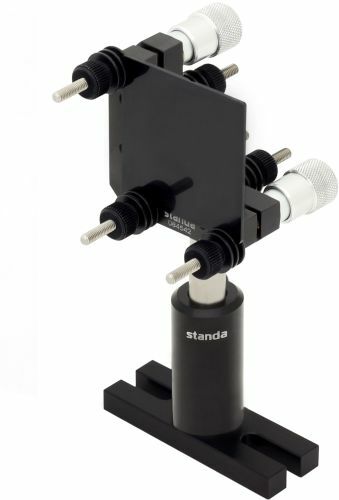 This allows to use all STANDA driving screws with these mounts. M6 tapped holes on the sides provide a wide variety of mounting configurations, either horizontal or vertical. A special L-shaped design of the Mounts provides for maximum clear aperture.